Stephen Marley, took the 2007 Reggae Grammy Award with his Mind Control released by Tuff Gong/Ghetto Youths/Universal Republic. 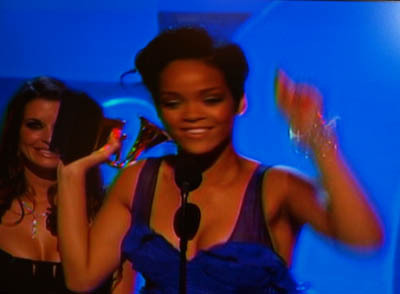 "Hello Barbados," as shout out from Rihanna at the Grammies. The official award ceremony was held Sunday night. The other nominees in the category were all reggae veterans from the 1960s: Burning Spear for The Burning Spear Experience (Burning Music Production); Lee “Scratch” Perry, The End Of An American Dream (Megawave); Sly & Robbie And The Taxi Gang, Anniversary (Taxi Records) and Toots & The Maytals, Light Your Light (Fantasy). Barbadian sensation Rihanna copped Best Rap/Sung Collaboration (For a Rap/Sung collaborative performance by artists who do not normally perform together. Singles or Tracks only.) for Umbrella, featuring Jay-Z, track from: Good Girl Gone Bad, (Def Jam Recordings). Rihanna was also nominated for Record of the Year, which was won by Britain’s Amy Winehouse’s Rehab, a track from: Back To Black (Universal Republic Records).